In addition to receiving NSF funding, Georgetown University was also awarded $51 million in research funding by the NIH in 2012. Of some of the best funded life science departments at Georgetown University, the money was distributed as follows in the list below, which is organized by department, number of awards and total funding granted. For a full list of all NIH-funded departments at Georgetown University, please visit the NIH website. In 2010, Georgetown University was ranked 83rd by the NSF for total R&D expenditures in the life sciences, having spent a total of $110.1 million. The NIH ranked the university 87th for direct plus indirect costs, excluding R&D contracts and ARRA awards in 2011. The total costs were $56.1 million. According to Dayton Daily News, Georgetown University recently received its largest gift in history: An $86 million endowment will be used towards medical research. Georgetown University’s website reports that the National Cancer Institute awarded researchers at the Lombardi Comprehensive Cancer Center $7.5 million in the form of a five-year grant. Georgetown University has also announced that a gift of $6.7 million will be used to establish a colon, pancreatic and gastrointestinal cancer center. 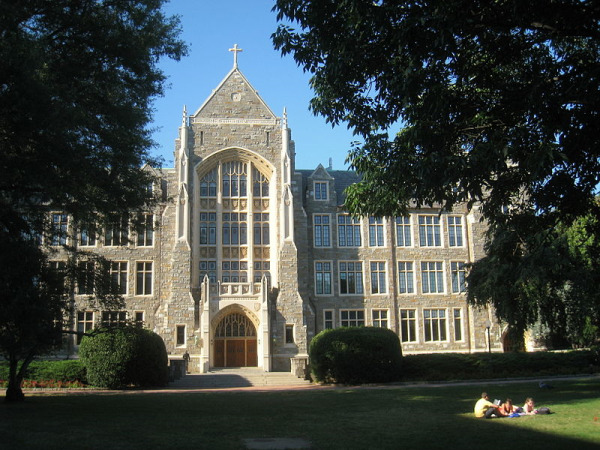 Don’t miss out on getting to know the life science sales market at Georgetown University! If you are a biotechnology vendor or lab supplier interested in getting the word out on your products in the District of Columbia, Biotechnology Calendar, Inc. invites you to attend our annual Georgetown BioResearch Product Faire™ Event held on October 17, 2013. Last year, the Georgetown BioResearch Product Faire™ Event was visited by 223 attendees. Of those attending, 59 were purchasing agents, professors, and post docs, and 24 were lab managers. The attendees came from 13 different research buildings and 21 departments campus-wide. Biotechnology Calendar, Inc. is a full-service science research marketing and event-planning company that organizes events and trade shows at top quality research universities across the country. For more information on our Georgetown BioResearch Product Faire™ Event, or to view more funding statistics for Georgetown University, click on the button below. If you’d like to learn more about a life science sales market closer to home, we encourage you to check out our 2013 calendar of events.